Street entrance, The Imperial Hotel, c. 1930. 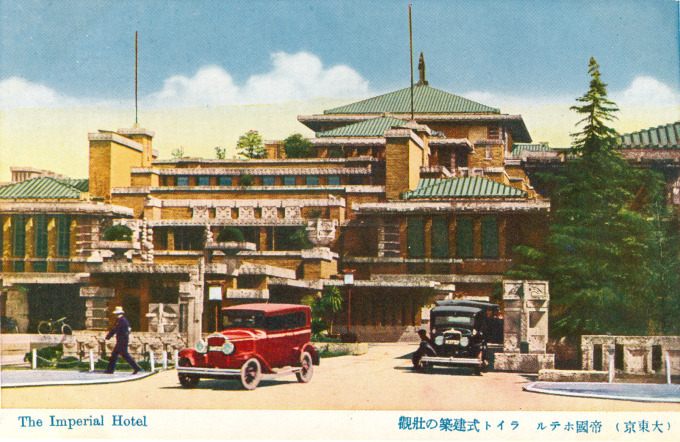 When a Tokyo old-timer recalls the Imperial Hotel [Teikoku Hoteru], they are, no doubt, remembering the luxury establishment that welcomed dignitaries and well-heeled visitors to Tokyo between 1923-1968, and which was known for two things: it famously survived the Great Kanto Earthquake only months after opening for business in June, 1923, and it was the most famous of six buildings in Japan designed and completed by American architect Frank Lloyd Wright 1. Under construction from 1915 to 1923, and made largely of volcanic stone and ferro-concrete, the Wright-designed Imperial Hotel enjoyed a 45-year reign as Tokyo’s premiere hotel. So highly-regarded was the Imperial that it was used after World War II (which it survived unscathed) as billeting during the Occupation of Japan for none but the most senior SCAP and Allied military personnel, and the leagues of Washington bureaucrats who paid the Japanese capital a visit. 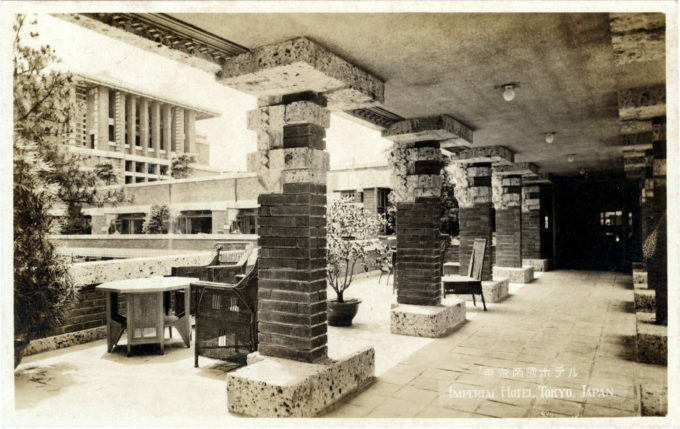 Upper terrace, Imperial Hotel, c. 1930. “The greatest success of the Imperial Hotel was the boldly monumental spaces Wright contrived to create in spite of restraints posed by the earthbound profile of the building with its purposely lowered center of gravity … It was valued for the opportunity it presented to distinguish building types by displaying a building’s character through a distinctive combination of ornament and plan. 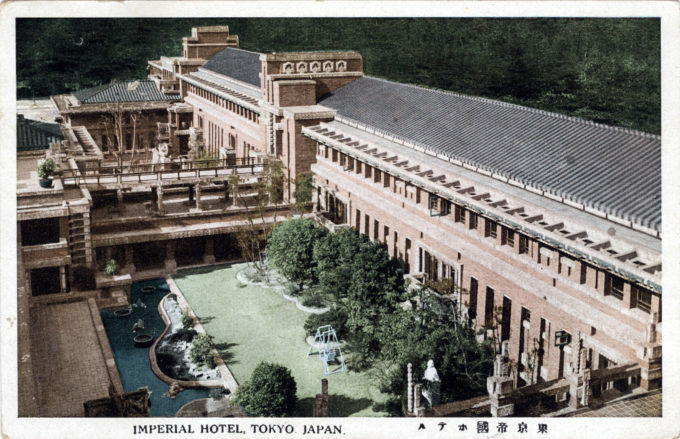 “The design of the Imperial Hotel is proof of this state of affairs, in terms of which Wright hoped, as he always did, to rehabilitate and redefine architectural Truth. 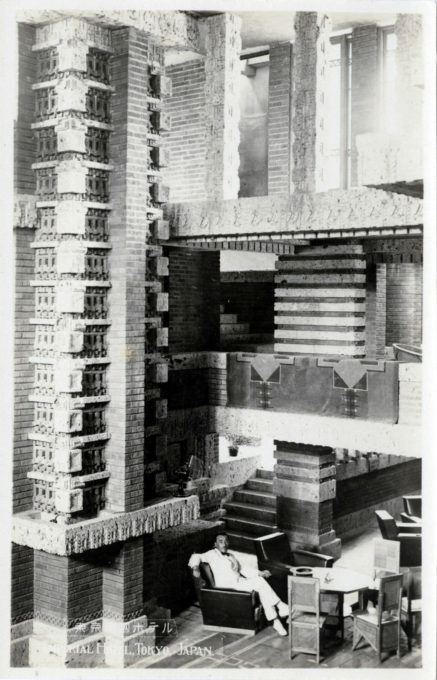 Interior stonework, Imperial Hotel, c. 1930. 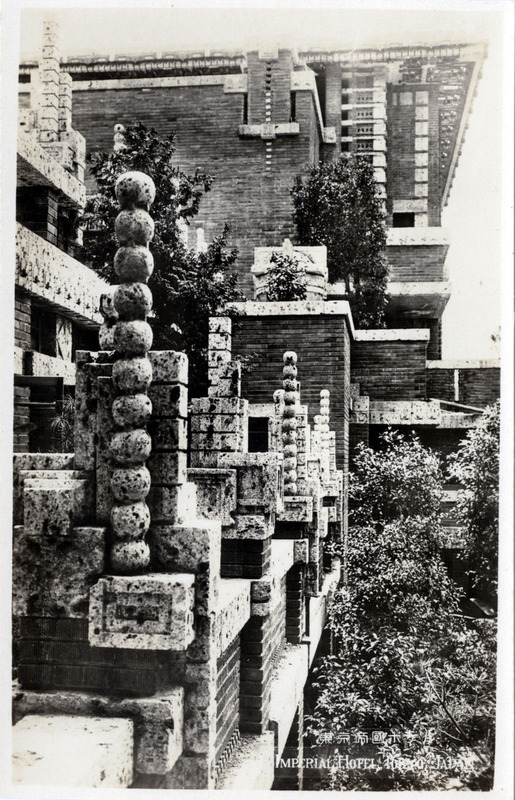 Exterior stonework, Imperial Hotel, c. 1930. 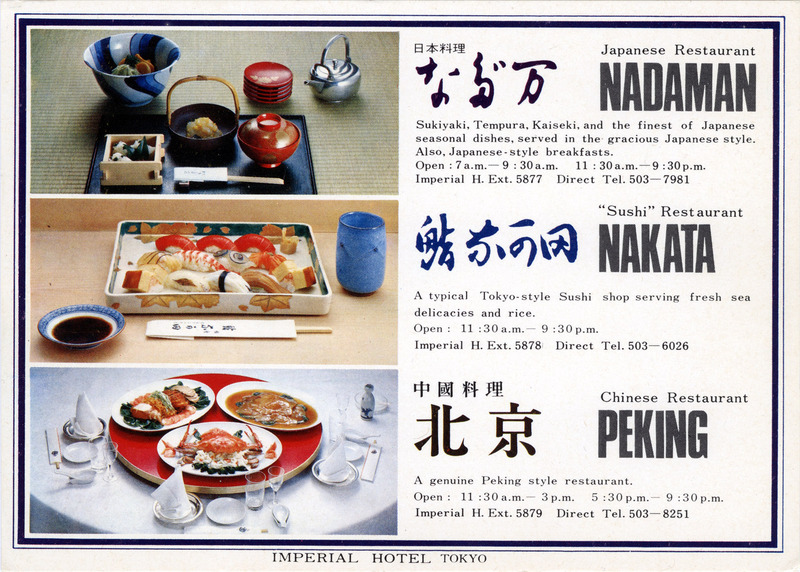 “Undoubtedly the Imperial Hotel is one of the world’s finest structures in point of character, which is all its own. It is not difficult to recognize the genius which conceived such a poem in stone and brick, and due praise must be spontaneously offered to the brilliant engineering talent which adhered to strictly straight lines and flat arches throughout the entire building. 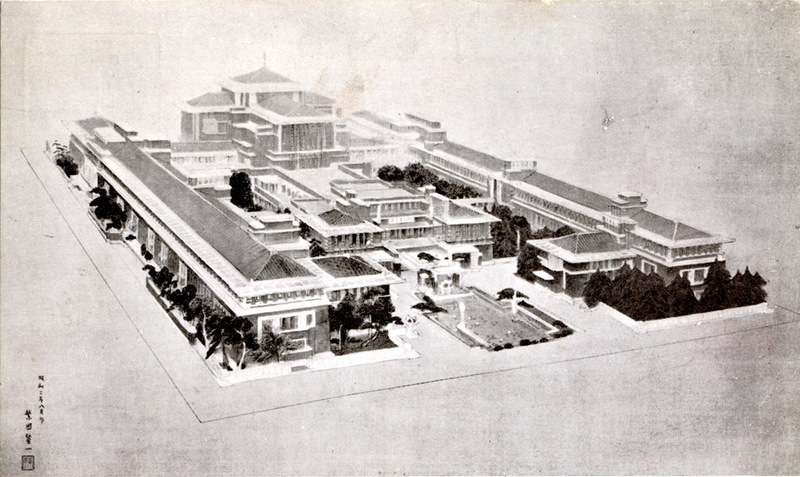 Architect’s rendering of the Imperial Hotel, c. 1923. 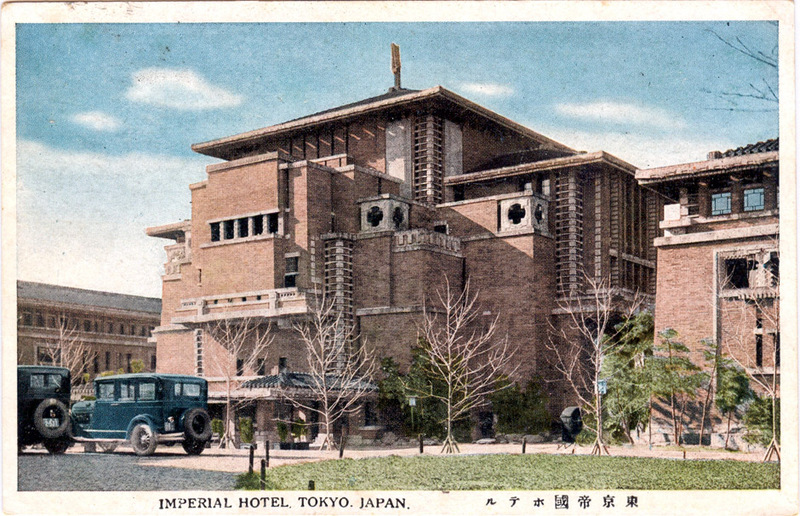 Imperial Hotel, front view, c. 1930. 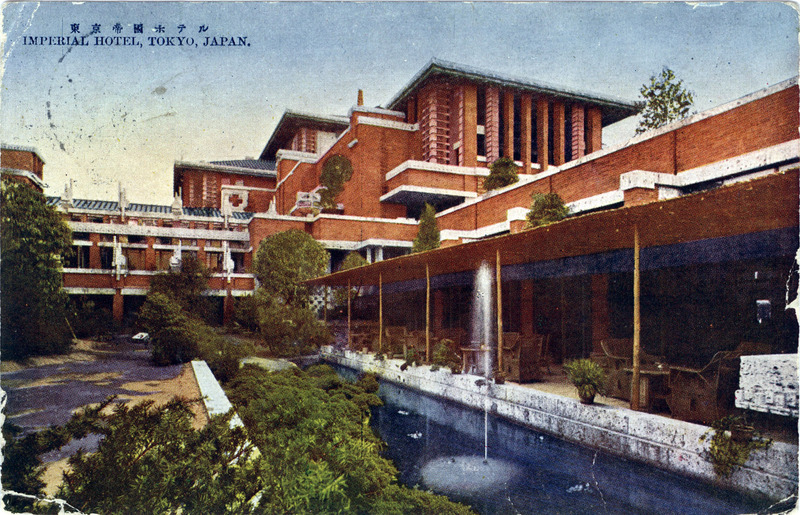 Inner garden, Imperial Hotel, Tokyo, c. 1940. 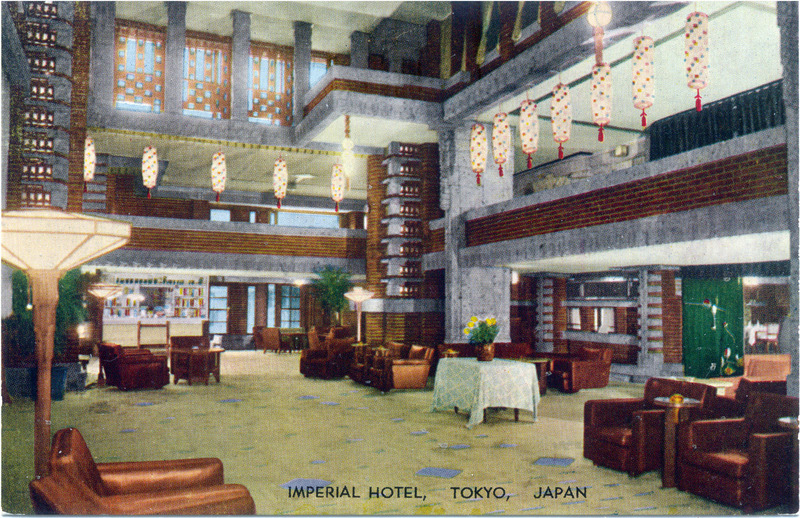 Imperial Hotel, front entry, c. 1930. 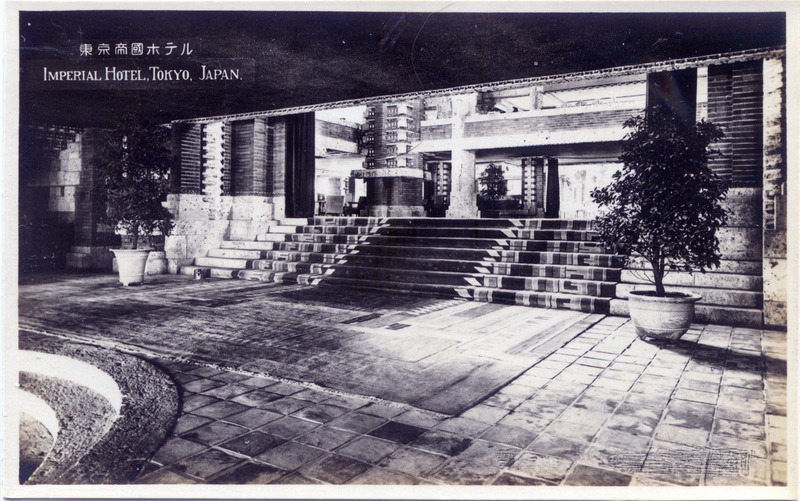 Imperial Hotel, rear entrance, c. 1930. Imperial Hotel, lobby, c. 1930. 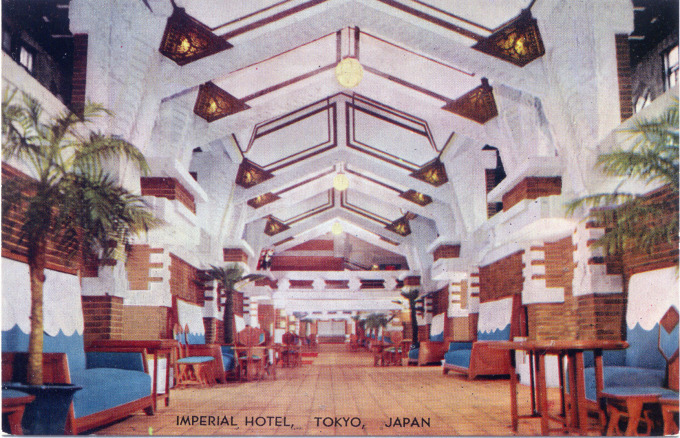 Imperial Hotel, “Peacock Alley”, c. 1930. 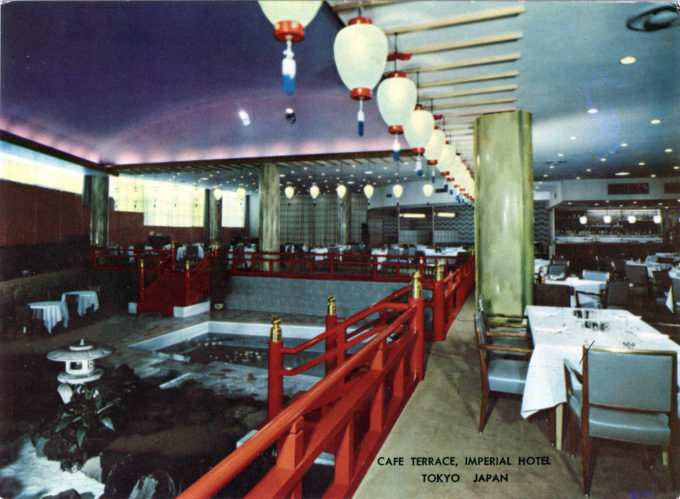 Imperial Hotel, Cafe Terrace, c. 1960. 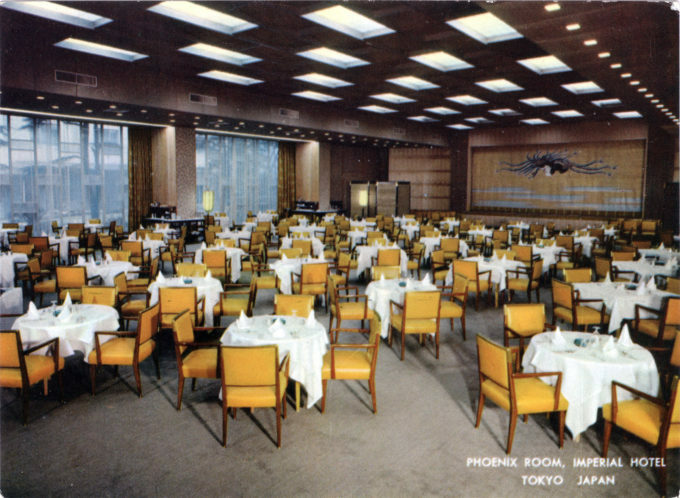 Imperial Hotel, Phoenix Room, c. 1960. 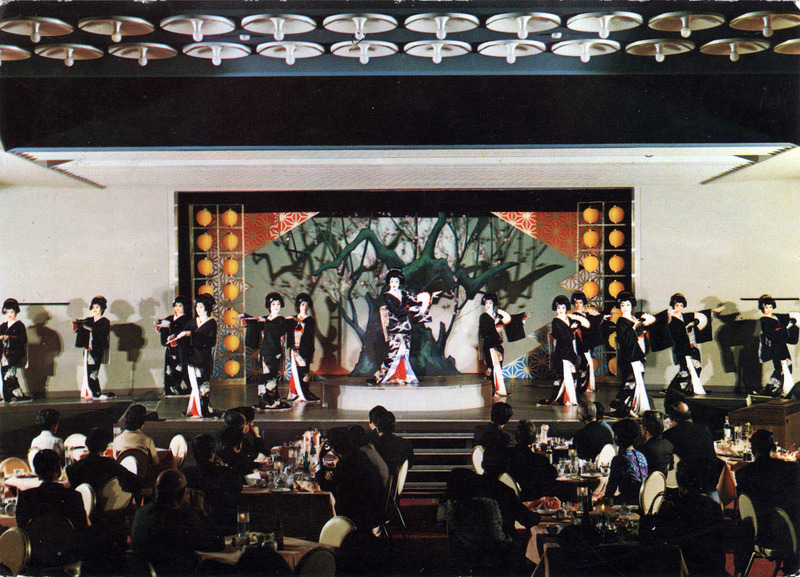 Imperial Hotel Theater, c. 1960. Imperial Hotel, restaurants, c. 1960. 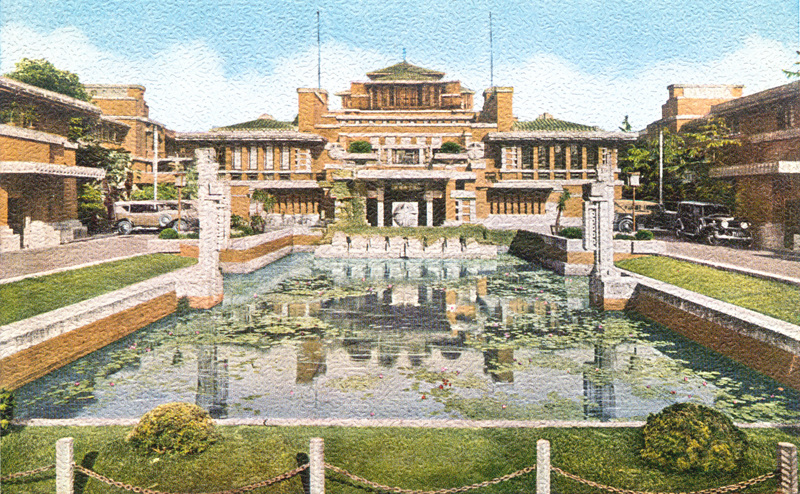 Inner courtyard and pond, Imperial Hotel, 1923. By and large, though, the Wright-designed Imperial would eventually be considered by the post-war traveler to be dark and musty, and its un-airconditioned rooms too small. The hotel’s foundation, too, had by then settled unevenly into the soft subsoil; its long hallways and corridors came to have a wavy, rubbery appearance about them. A more modern but thoroughly plain (and very un-Wrightesque) multi-story annex was built behind the main building in the 1950’s. Magazine advertisement announcing the opening of the present-day Imperial Hotel, on March, 10, 1968. 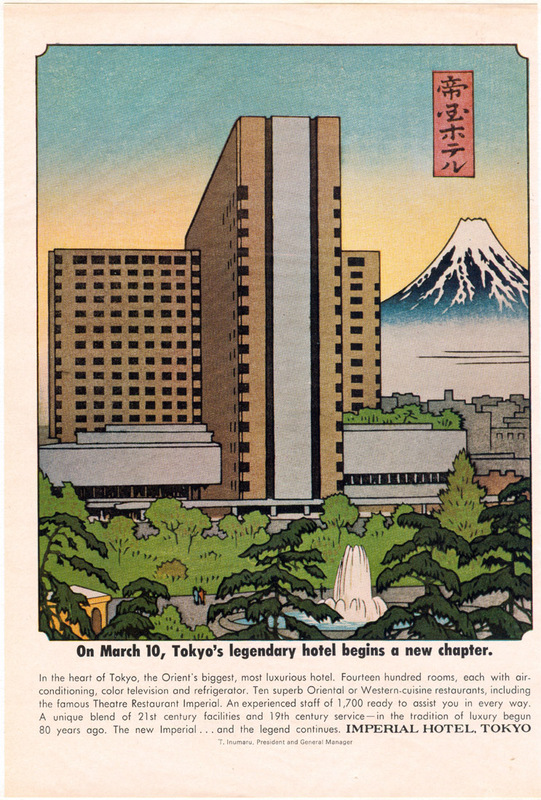 Finally, in 1968, the Wright masterpiece was demolished and replaced by a gleaming, ultra-modern four-star edifice. All that remains of the “Wright” Imperial nowadays is the hotel’s front facade, preserved today at Meiji Mura, the outdoor architectural museum near Nagoya that hosts a large collection of Meiji era architectural art. Even though the Wright-designed Imperial was not a product of the Meiji era — as the first Imperial most certainly was — it came to symbolize for many people — Japanese and gaijin alike — the great degree to which Tokyo had matured during its first hundred years into a grand, majestic and, yes, a most civilized world city.